What If, Your Dreams Could Become Reality? Did you ever have a dream of a South Pacific Island Paradise with pure natural beauty, colorful friendly people in combination with romance and relaxation. A place where the vibrant colors of the tropics are blending in with the living culture of the island. You just found Samoa. We might not be perfect in everything we do, but what you will experience comes directly from our heart. This is the way we grew up and this is what we like to share with you. Come and be a part of Samoa, come and be a part of Aga Reef Resort. Our resort restaurant sets a warm, natural atmosphere with fabulous ocean views and a large expanse of deck so that you can also enjoy al fresco dining with the warmth of the sun on your back or under a moonlit sky. 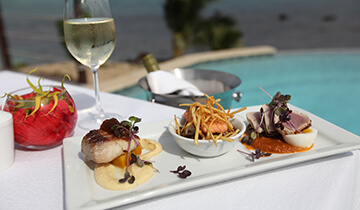 Food really matters at Aga Reef Resort and it is with pleasure that we offer our guests a first class menu offering quality local and international cuisine. Our chef has put a lot of time and effort into ensuring that dining is a taste sensation and that over the course of your holiday you will be able to enjoy a variety of food utilising the finest fresh local produce. You might want to enjoy a romantic candle lit dinner on the deck while listening to the hypnotic sound of the waves breaking over the reef, or have a long lazy lunch poolside. The restaurant opens up to the ocean front and also to our large deck by the swimming pool, leaving it up to you to decide if you prefer to have a roof over your head or just the moon and the stars when enjoying a sumptuous dinner with family and friends.